Austrian writer on music; born at Eibenschütz, Moravia, Nov. 1, 1855. His father, Joachim, a physician, died in 1857, whereupon his mother removed to Iglau. He was educated in Vienna, where he studied music at the conservatory under Bruckner and Desoff. In 1878 he was graduated from the Vienna University as doctor of jurisprudence, and in 1880 as doctor of philosophy. His dissertation, "Die Grundklassen der Christlich-Abendländischen Musik bis 1600" (The Chief Divisions of Western Church Music up to 1600), was reprinted in "Allg. Musikzeitung," 1880. 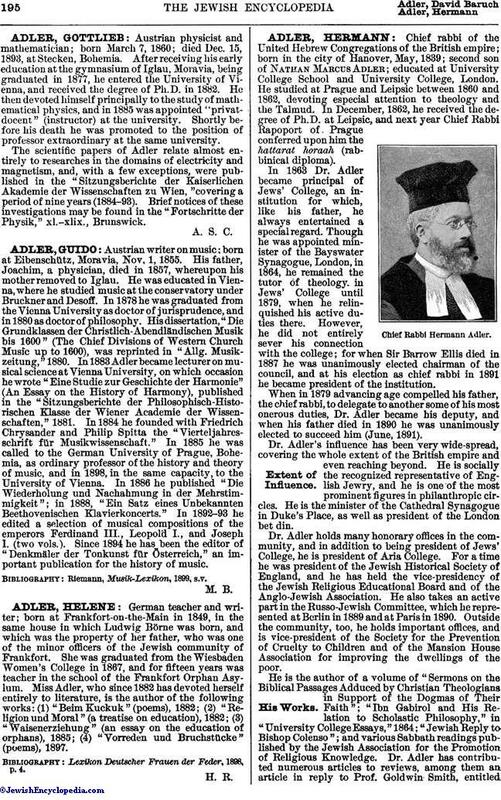 In 1883 Adler became lecturer on musical science at Vienna University, on which occasion he wrote "Eine Studie zur Geschichte der Harmonie" (An Essay on the History of Harmony), published in the "Sitzungsberichte der Philosophisch-Historischen Klasse der Wiener Academie der Wissenschaften," 1881. In 1884 he founded with Friedrich Chrysander and Philip Spitta the "Vierteljahresschrift für Musikwissenschaft." In 1885 he was called to the German University of Prague, Bohemia, as ordinary professor of the history and theory of music, and in 1898, in the same capacity, to the University of Vienna. In 1886 he published "Die Wiederholung und Nachahmung in der Mehrstimmigkeit"; in 1888, "Ein Satz eines Unbekannten Beethovenischen Klavierkoncerts." In 1892-93 he edited a selection of musical compositions of the emperors Ferdinand III., Leopold I., and Joseph I. (two vols.). Since 1894 he has been the editor of "Denkmäler der Tonkunst für Österreich," an important publication for the history of music.